Please join me in welcoming today’s guest blogger Nan Baker of Purrfect Spots – A place where needlework and animals are loved. She’s sharing her love of crafting and the inspirational work she’s done teaching and helping others to learn how to take care of pets during disasters. She’s also put together a slide show on “Safety Tips for Pets” and is giving away a gift too. My grandmother taught me to knit and my first project was a doll skirt. My first cross stitch project was a rooster on a red cloth with black floss. I embroidered a pillow case at camp. I made my first outfit in middle school (then it was called junior high)! And I made all my clothes when I went to college. And it didn’t stop there. I always had a project going my entire life and I still do today. But if you would have told me that I would become a designer with my own company because of a cat – I wouldn’t have believed you. Twenty years ago we moved to Florida with our 2 cats. My family had vacationed there and I loved it. It was my dream to become a "little ol’ lady on the beach with lots of cats"! Be careful what you wish for! Thanks to a loving husband, I am living my dream! However, one thing I didn’t anticipate was having lots of hurricanes (a few maybe, but not lots)! We evacuated many times. Not much fun, but very necessary. We always took our cats – there was no way I would leave them behind. But 20 years ago, not much thought was given to animals in emergency situations. Hurricane Andrew in 1992 changed all that thanks to the many animal agencies that responded to that disaster. Emergency Management officials saw the need, but it was a slow learning process. The issue was raised again with Hurricane Katrina in 2005 and fortunately, since then, emergency officials have listened. 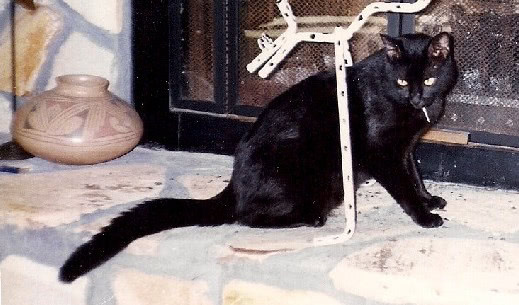 There was a little black cat that came into my life right before Hurricane Opal in 1995. Casey was a feral cat and I couldn’t get close to him when we evacuated, so I had to leave him behind. The next day when we returned (and that is another story) Casey ran to my arms. I became very attached and when he passed, I decided his little life should not be in vain. Read the complete story of Casey on my blog! Because of Casey and my love of animals, I became involved with The Humane Society of the United States and was part of their Disaster Animal Response Team (DART). As a result I worked fires, floods, tornadoes and hurricanes. I saw firsthand the need to get the word out about taking care of pets during disasters. Therefore I created The CASEY Plan (Caring for Animals Safely in Emergencies during the Year) in memory of my little black cat to help promote animal disaster preparedness. And that is also when I created Purrfect Spots. 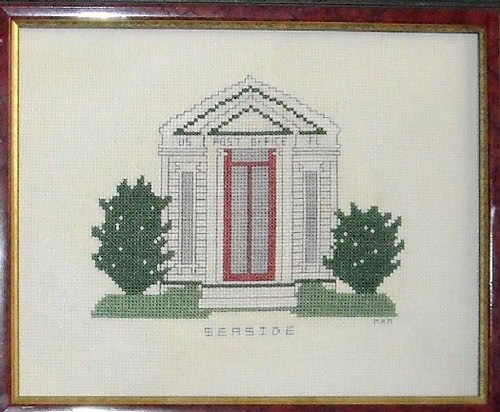 Living in a resort area, I designed cross stitch patterns of local landmarks. A portion of my sales goes to The CASEY Plan which promotes animal disaster preparedness. My first effort was the Seaside Post Office (Picture). One thing led to another and I started creating all sorts of cross stitch patterns and then added needlepoint. Well it was only natural to go into quilting as a lot of my patterns worked beautifully as appliqué. 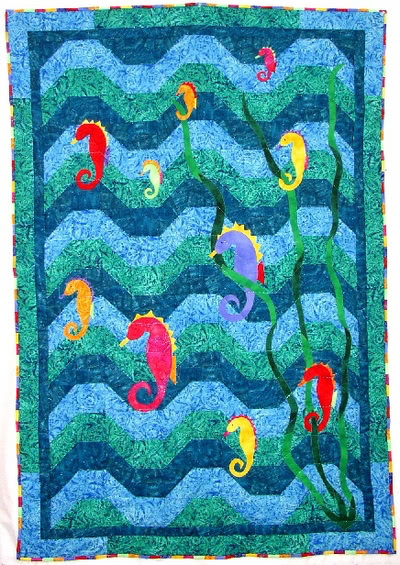 I fell in love with quilting and that is what I design today, both applique and pieced. 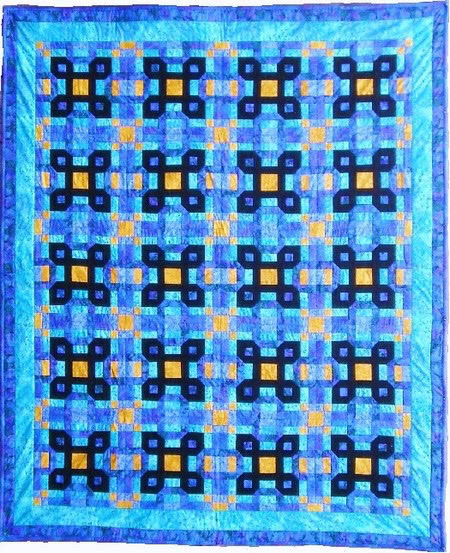 I love to hand quilt as I find it very relaxing and good therapy. It is one place in my life that I can make the pieces fit (if they are cut right). I am also the Marketing Director for The Quilt Pattern Magazine. However I still am very much involved in the promotion of animal disaster preparedness and safety. Casey’s legacy lives on! That is why I created this “Safety Tips for Pets” slide show for all my sewing friends with pets. I have enjoyed being a guest on the Quilting Gallery today and I hope you have enjoyed the story of my journey as a quilter and animal lover. In appreciation of your visit, I do have a contest! Leave a comment below telling me if you have a pet, (name & description) plus what poses a threat for them in your sewing room. There will be a random drawing for a special gift next Wednesday! This give-away is now closed. Congratulations to #14 Jennie P. for winning. 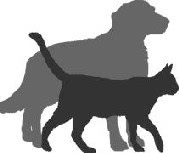 I have 2 pets…a boxer named Mocha and a pekingese named Minnie. They are both rescue dogs and wonderful pets. They have no threats in my sewing room because they aren’t allowed in there! I know that pins and irons can be threats and it is just best not to take any chances. Thank you so much for all you do ! We have two dogs that we love and they are a big part. of our family. I enjoy embroidery in the evening and lay my tools and thread on the coffee table . I always have to be sure and put these away when I am finished so that our babies dont get hold of them and injure themselves. They are too precious ! I don’t have a dog right now. I did before but haven’t replaced her yet. I didn’t let my dog in the sewing room cos there was too much for her to get into. I’m ‘in between’ pets at the moment, but my black cat (with a white forehead star), Lancelot, once ate a bunch of scrap thread AND the leg of a pantyhose that I was using for stuffing. He had to have surgery and was lucky that he recovered and lived a long life. It sure taught me a lesson — anything that sticks to kitty-paws is fair game to be swallowed, so it has to be put safely away! I have a dog, named Zeke. He was a stray until 1 1/2 years old when I adopted him. He has become a lovely dog, but he does have a bad habit of chasing trucks which I haven’t been able to completely break. The hazards for him in my sewing room are me tripping or stepping on him. There isn’t a lot of floor space and he likes to come in and lie on the floor when I’m working in there. I have an old border collie, named Thunder. There is absolutely nothing that threatens him in my sewing room, because my sewing room is in the basement, and he won’t go down the stairs! My cat lives in California – because I have grown allergic. My cat is 17 years old and his name is Paws. His litter mate and brother, Patches, passed away last winter. I have two cats: Toby is nearly 16 yrs old a black and white “tuxedo” cat and Obama is 2yrs black all over. He was the last of a litter of 5 that was born on Presidents Day 2010 the only black kitten; so of course I had to name him Obama the only black president and the most recent. Neither one really bothers my sewing things so there is no iminent danger. My beloved beagle, Barney, is always in harms way in my sewing room because he likes to lay close to my sewing chair which is on wheels and I am forever rolling into him when I roll over to my pressing table. He will usually move and lay just far enough away to be close! I have 2 cats who I call the “quilt police”. They test every quilt I work on for comfort & durability. When I’m sewing I do take extra care to keep the pins & thread out of their reach. My female cat, Lucy, like to eat & unroll thread! I have two shelter cats. One doesn’t care a bit about the sewing room. The other’s biggest threat in the sewing room is ME! Tycho, get off the quilt. Tycho, get off the fabric. Tycho, get off the cutting mat. Tycho, stop licking my sewing machine! Tycho, I swear to God, if you don’t get out of the fabric cabinet, I am going to lock you outside! No, no, it’s totally okay if we share my sewing chair, Tycho. No pets here – though I had a friend’s cat get into her trash and swallow a bunch of threads. The threads got hung up in the cat’s intestines and they had to do surgery. I have two dog children. One pit bull, named Ivy who has a beautiful cream and white coat and she has crystal blue eyes. She’s my baby girl. And Remus, my mutt, is a large breed. He may be a lab. I have no idea what he is actually. I picked both dogs up off the highway (not on the same day) when they were little. They would have gotten killed. I couldn’t stand to see them without homes and I didn’t want to take them to the pound in case they’d get euthanized. I don’t let them in the sewing room though because the long pet hair would get all over my fabric. We have 4 Labradors, Bailey, Riley, Reesie, and Hershey. My daughter who just moved out took her two cats Jethro and Ely Mae, who hung out with me in my sewing room all the time. I learned a long time ago, to never put a threaded needle in my pin cushion, and to push ALL the pins ALL the way into the cushion too. If you left any straight pin somewhat sticking out, Ely would pull them all out, then they would be everywhere! When we were under threat of tornadoes the summer we were camp hosts in Georgia, we were responsible for the safety of all our guests. We explained the shelter plan (huddle in the bathhouses, and bring your pets!) and were thoroughly taken aback at the “minister” that insisted we not shelter the animals, but rather save the space for people only. In no uncertain (and probably with a little overstepping of my bounds) terms, explained that we didn’t have animals in our lives, then life just wasn’t worth living. All the other campers were grateful and they brought their animals into the shelter, every time. And surprise, surprise (not!! ), all the animals got along well….ferrets, dogs, cats, and even a parrot! Currently, we have one rescued pup – hard to say who rescued whom….a little mutsy named Bailey. She is always under my desk or ironing board when I’m in the sewing room. Sometimes she will locate a dropped bobbin or pin and that’s when I just freak out. I don’t know HOW she can be happy chewing on a pin, but she seems to love ’em!! I’m truly thankful there are people like you in this world, that actually implement the changes that make it a better place!! I have 8 doggies and 1 african grey. The doggies love my quilting sessions at night and seem to want to sit on the work while I am busy stitching especially muffin, the scottie. I LOVE animals – feed 12 stray cats at college each day and 10 hadida birds. I am afraid that they are inquisitive during the day while I am at work and get hold of my pincushion with pins – they have done it before – ate the pincushion that only the pins were left laying around. I love to hear that other people are animal lovers as well – it is so rewarding!!!!! We have a dog, Alex, who’s a total mix, with lab and shepherd in him, and we have a cat, Stripes. Neither one lives in our house, as we have a child allergic to them, so they both have a house outside. Another cat we had before this one, (since we live on a farm, they don’t seem to survive for too many years.. ) used to go into the doghouse with the dog and curl up with him, but this tabby is not as friendly with the dog as the other one was. So this one goes into his own house, and stays warm and dry there during the winter months. LOL, I have quite a few pets. I have 2 dachshunds, Fancy and Gohan, 1 rabbit, Spike, and 3 cats, Daemon, Thor, and Georgie, and all my bantam Silkie chickens. I think there is 55 of them now and my 4 Black Copper Marans chicks. Plus my MIL lives with us and she has 2 cats of her own, Nikita and Balong. My sewing area is in my bedroom so I clean up after myself each time I do anything. All of my fabric has its own plastic tub, and my WIP’s are kept in decorative tins. There really isn’t much of a danger to the animals in my area. My MIL, on the other hand, has an entire room devoted to her crafts. I worry about her cats because she leaves her iron laying on the ironing board and I’m afraid they will pull it down on themselves playing with the cord. I’ve mentioned it to her before but she’s 75 and set in her ways. She constantly complains that she doesn’t have enough room, yet she will not get rid of anything either, LOL. She has boxes of yarn, sewing patterns, dollmaking items, and upholstery material that haven’t seen the light of day in over 10 years, yet she must keep it because she may use it at some time. I worry about fire a lot because of all this stuff just sitting around in cardboard boxes. But I have a fire plan in place for the animals! We live in the country and have feral cats around the house. They have let us pick them up to pet sometimes, because we feed them, but just for a couple minutes. This is great, thanks for thinking of this! I have one cat named Sigmund who was rescued as a kitten and has just turned 5 years old. He loves my sewing room and I’m constantly afraid that he will hurt himself with pins. I’ve just started a project that combines quilting and the humane society. I am making flannel safety blankets for abandoned cats to help ease the transition of rescue and adoption. Also, hopefully, to raise awareness and inspire others to do the same. I did have a cat. (She is sadly gone now.) But Gidget loved to help me sew. She would get up on my sewing machine and watch me sew. When I set out blocks on the floor in preparation to sew together, she always sat in the middle and gave me her view too! I miss her. I have a 3 year old cat… She rarely comes into the sewing room and isnt interested in the quilts… unless they are on my daughters bed….